In 2006, Development Guild partnered with the Melton Foundation—a nonprofit fellowship program that promotes and enables global citizenship—on their executive search for an Executive Director. We placed Winthrop Carty, who has been with the foundation ever since. For a new series on our blog, we recently caught up with Winthrop to find out what he’s been up to all these years & what he’s enjoyed most about being Executive Director at Melton! What initially attracted you to the Executive Director position? Prior to joining Melton, I had worked in educational development and cultural exchange programs such as the Fulbright Program in Latin America. From there, I joined the Harvard Kennedy School of Government, where I helped run a global social innovation program. This experience awoken an interest in social innovation and the use of technology in development and education initiatives. The Executive Director role at Melton was attractive to me because it had elements of both of these prior experiences: the opportunity to work with young people and promote cultural exchange while focusing on global leadership development and social innovation. The Executive Director position also focused on social entrepreneurship and innovation which excited me. I was invigorated by the fact that Bill Melton [Melton Foundation’s founder] was a tech entrepreneur, who clearly had an innovation mindset. I felt I could go from working in an ivory tower to being part of something much more entrepreneurial, flexible, and primed for growth. I imagined there was a great opportunity as the Executive Director to really build up the organization, and this became very clear and exciting during the interview process. Additionally, up until joining Melton, I had lived in and traveled extensively throughout Europe and Latin America but had had limited exposure to Asia and Africa. I was eager for the opportunity to become more familiar with these regions and work globally. What have you loved most about your time at Melton? After 12 years at Melton, I feel a deep sense of accomplishment, and I love what my colleagues and I have been able to achieve together. I’ve had the opportunity to help build a new program. Since I first joined the Foundation, we’ve developed a learning curriculum, and added a new partner university in Africa. The Ashesi University is an amazing, pioneering institution that provides an innovative education that’s unique not only to Africa, but the world. I also love the people and the culture of Melton. Everyone here is friendly, open, and collaborative. It’s a rewarding experience to work with them and to interact with our fellows. Over this decade plus, I’ve watched wide-eyed 20-year-old kids become mid-career professionals. To witness their growth and to be a part of their lives throughout – it’s been a very fulfilling experience. How have your position and responsibilities changed since you began? My role has evolved as our organization has evolved. When I first joined, I was entirely focused on internal management. This shifted a few years into the position when we developed a new strategic plan. We recognized that the world was changing with the rise of technology, and we had to change as well so as not to become obsolete. It was a time of great growth. Our mission and vision changed; as a result, staff was restructured, and we developed a curriculum and new selection criteria for the fellowship. We evolved from primarily logistics work (the core of our program when I started was putting students on planes to go to a symposium overseas for 8 days) to becoming more focused on global citizenship, which we defined as one’s impact in society. In addition to fostering cross-cultural exchange, we are training young leaders to make a difference in the world. With this refined mission, my role became less focused on internal structuring and program development, and more externally focused: I became responsible for recruiting partner universities, funders, speakers, and all types of collaborators all over the world. For the past 6 years, I’ve spent much more time attending conferences and networking with leaders in various social sectors. What are your and your department’s greatest achievements since you’ve joined the Melton Foundation? We’ve had a number of milestone achievements. As I mentioned, we developed a curriculum focused on global citizenship. The Junior Fellow learning program is 2.5 years and educates our fellows on a variety of topics: design thinking, social marketing, project planning, storytelling, cross-cultural communication, and timely issues, such as climate change and access to proper healthcare and education. Along with developing this program, we have refined and improved our fellowship selection criteria. It’s become a more competitive program. I’m proud that the fellows we select share a deep belief in and commitment to our mission. Finally, we’ve also formed partnerships with a number of well-known organizations around the world, including Net Impact, MIT’s D-Lab, and the HPI Design School in Germany. These partnerships enhance the quality and impact of our Foundation, and the range of content and ideas to which our fellows are exposed. What do you hope to achieve at the Melton Foundation in the future? It’s actually a really interesting time for us right now. 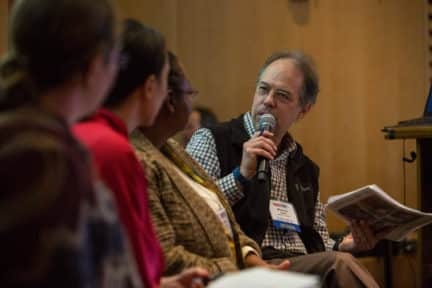 We’ve undertaken what we’re calling a co-development process; together with 500+ fellows, the board, and our staff, we’re defining a new strategic plan that seeks to answer a few questions: How can we increase our impact in the world? How might we open the fellowship to new communities (meaning new regions, in addition to new member universities)? And how can we continue to make our work relevant? We plan to have this new direction outlined in 2019. It’s a very exciting process! We are proud to have partnered with an array of nonprofit organizations on 650+ executive searches. Click to learn more about our current executive searches as well as our recently completed searches.